The Academy of Public Administration under the President of the Republic of Azerbaijan (Azərbaycan Respublikasının Prezidenti yanında Dövlət İdarəçilik Akademiyası) was established on 3 January 1999, as the Baku Institute of Social Administration and Political Science. The flag of the Academy of Public Administration (photo, photo, photo) is white with the university's emblem in the center. ADA, established in 2006, was transformed into a university by a Presidential Decree signed in 2014. ADA University (website) is dedicated to preparing innovative global leaders and to promoting useful collaborative research on diplomacy, public and international affairs, business, humanities and sciences, information technologies and system engineering. The university is made of a single faculty composed of the Schools of Business, Education, Public and International Affairs, and Information Technologies and Engineering. The flag of ADA University (photo, photo, photo, photo, photo) is vertically divided dark blue-white-dark red (1:2:1) with the university's emblem in the center. Blue is a symbol of loyalty and communication. White is the colour of purity of honor and mind, clean of prejudices, and in search of knowledge, enlightenment and education. Red is a symbol of life, energy, vibrancy, rejuvenation, reinvention, and innovation. The four blue lines in the emblem represent the four pillars of the university: global leadership, innovative learning, social responsibility, and thriving location. The red letters "ADA" represent the university standing tall on top of these pillars. zerbaijan State Oil and Industry University (ASOIU / Azərbaycan Dövlət Neft və Sənaye Universiteti - ADNSU; website) originates in the technical school established on 10 November 1897 in Baku. ASOIU is composed of 7 Faculties (Geological Exploration, Oil and Gas Production, Chemical Technology, Oil Mechanical Engineering, Power Engineering, Information Technologies and Management, Economics and Management), 28 Departments and 6 research laboratories. 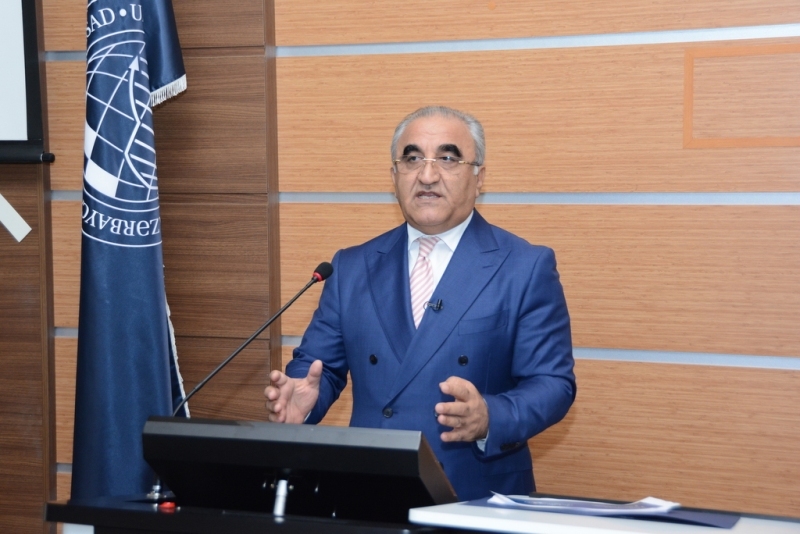 ASOIU is the Azerbaijani leader of the Azerbaijani-French University (UFAZ), a cooperation project initiated in 2014 by the Presidents of Azerbaijan and France and operated since September 2016. The French partners are the University of Strasbourg (UNISTRA) and University Rennes 1. The flag of ASOIU (photo, photo, photo, photo, photo) is white with the university's emblem, made of the stylized acronym "ADNSU". Azerbaijan State University of Economics (website), which was founded in 1930, is one of the largest higher education institutions in the Southern Caucasus. It is composed of 9 faculties operating at the universities with more than 18.000 students studying on 21 specialties. The current flag of the university (photo, photo, photo) is dark blue with the current university's emblem in the center. THe former flag was blue with the former emblem in the center. Odlar Yurdu University (website) is a private university located in Baku. It was founded in 1995, and became a degree granting institution on 8 July 1998. The name is based on the official Azeri national motto, "Oldar Yurdu", which is translated as "Land of The Eternal Fire". The flag of OYU (photo) is white with the university's coat of arms (photo), surmounting "oyu.az" and the country's name. The top half of the coat of arms contains the colors of the Azerbaijani flag, running diagonally from upper right to lower left. Centered on the red stripe is a gold-colored map of Azerbaijan. The bottom half of the coat of arms is divided evenly horizontally. The top is pale blue with three red flames, while the bottom is light blue with "Baki 1995" in white characters. A banner above the shield reads "ODLAR YURDU" while one below the shield reads "UNIVERSITETI" in gold capital letters. Qafqaz University (Caucasus University, website) is a private university located in Baku. It was founded in 1993 and was the first and the only foreign private university in the country. The flag of the university (photo) is white with the university's emblem in the center. The flag of the Qafqaz University sports club (photo) features the university logo in white centered on a blue field. Above the logo are the words "Qafqaz Universiteti" in white serif letters, with the words "idman Klubu" in larger white serif letters. The football club Qafqaz University FK played in Azerbaijan's First Division (the second tier) during the 2008-2009 season.